Group ampm born of the need detected in the market to improve delivery times and quality in the sector in Mexico messaging. With over 25 years’ experience in the market, we aim to provide logistics solutions to our business partners and customers through safe, fast and reliable services in Mexico. We are a committed, with passion and dedication, trained for each of our different divisions work focused on results and high standards of quality in services of Courier, Freight and Distribution, Storage, Manufacturing and Quality Control. 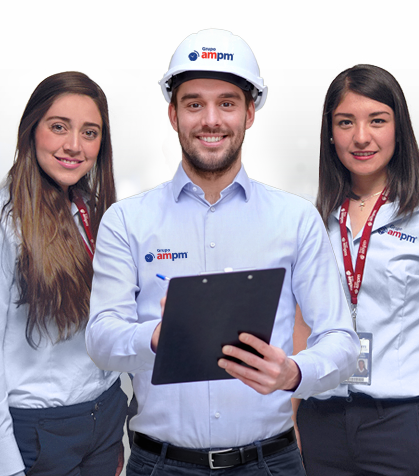 In ampm Group we have established four principles that we apply to all our services and are linked to the institutional values that govern our organization. Therefore we highlight and present the values and principles of Group ampm in each of our actions and decisions. We provide the elements for people, the products and facilities are free of risks, offering tranquility to our family, our clients and the team members of Grupo ampm. When it does, the company is rewarded with innovation, loyalty, productivity and improved morale at work. The best leader is not going to get very far without a competent team behind him. We are correspondents, we depend on the work of our colleagues. To facilitate logistic solutions and of communication generating bows between our commercial partners and their clients, through safe, fast, punctual and friendly services in Mexico. To communicate Mexico with excellence and passion generating progress for our families, looking to transcend, fulfilling our commitment to God.